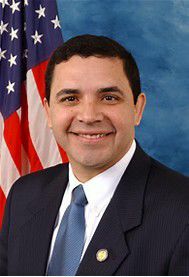 U.S. Rep. Henry Cuellar is standing by his vote for legislation that activists argue will allow for the indefinite detention of migrant children. Cuellar, D-Laredo, said that assessment of the Cole Amendment is wrong and that people who say it will lead to indefinite detention are either lying or ignorant. The Cole Amendment, introduced by U.S. Rep. Tom Cole, R-Okla., amends the 1997 Flores settlement which bans the long-term detention of migrant children. Cuellar was the sole Democrat to support it. He said family units that are released become part of the backlog of cases of which he said there are about 700,000. “By the time they get to 700,000 cases — that’s going to be years, and years, and years — the ones that are kept in detention, those cases are done much, much faster,” he said. The amendment was among several passed by the House Health and Human Services appropriations committee on Wednesday. In the appropriations bill, Cuellar also helped secure language that would allow the Office of Refugee Resettlement to accept in-kind donations from non-governmental entities. Donations would include medical goods and services, school supplies, toys, clothing, and other items that would help “provide for the care of unaccompanied immigrant children in HHS custody,” according to a news release issued Friday. That stemmed from Cuellar’s most recent visit to McAllen, he said, when Alonzo Cantu, businessman and co-founder of Doctors Hospital at Renaissance, told Cuellar he wanted to donate doctors’ services to care for the children free of charge. Another individual, Cuellar said, wanted to donate supplies but Border Patrol informed the congressman they weren’t allowed to accept donations from private entities or non-profits. He also helped secure language the Detention Facility Violations amendment which directs ORR to maintain strict oversight of the facilities it funds and to immediately address any violations of federal, state or local codes. “We’re saying ‘Hey, you guys have to make sure that you meet and address any violation of federal, state, or local codes regarding the welfare,’ because we want to make sure the kids are all taken care of,” Cuellar said. The congressman also addressed another criticism, this one over contributions he received from GEO Group, the largest for-profit prison operator in the country. Cuellar received $32,400 in political contributions from the company this election cycle, The Monitor previously reported. Cuellar said the amendments passed on Wednesday do not affect GEO Group, saying the HHS does not receive funds from HHS. The company does, however, hold contract with Immigration and Customs Enforcement, overseen the Department of Homeland Security, and runs the Karnes County Residential Center, ICE’s largest family detention center in the country. Other amendments that were passed on Wednesday include a direction to ORR to regularly report on “the number of children in its custody who have been separated, the length of their separations, the status of subsequent reunification efforts, and the number of successful reunifications,” according to the news release. There were also amendments that assured a member of Congress would be allowed access into detention facilities housing immigrant children, directed ORR to provide basic health needs to the children, ensured that separated immigrant children were held with their siblings “whenever possible” and directed HHS to open lines of communication between the separated children and their families. “Bottom line is, I don’t think the Trump Administration, HHS, was ready for all this,” he said regarding the attempts to reunify children with their families.